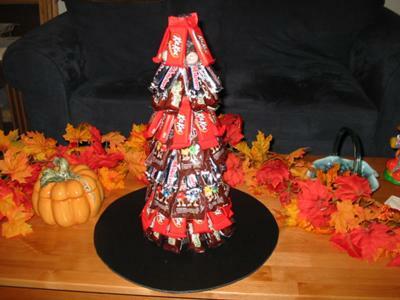 Here's a chocolate candy witch's hat that I made. First I took some core foam (gator board) which I bought at a craft store and spray painted it black. If you look, you can see that I hot glued candy in circular layers starting at the bottom and going to the top of the hat. I made sure each bar was glued just through the paper and not on the candy - just in case! In places where the bars left an open space, I glued on those oozing eyeball gum balls. I did mine in layers of each type of candy but you could go random instead. My husband brought it to work as a treat for his fellow workers. This is my own idea taken from a topiary I saw someone make on a Martha Stewart show one time. I did see the candy topiary on Martha Stewart, too. Your take on it is great. I bet your husband's workmates loved it. I was thinking this could be altered slightly to make an adorable Christmas tree, too.